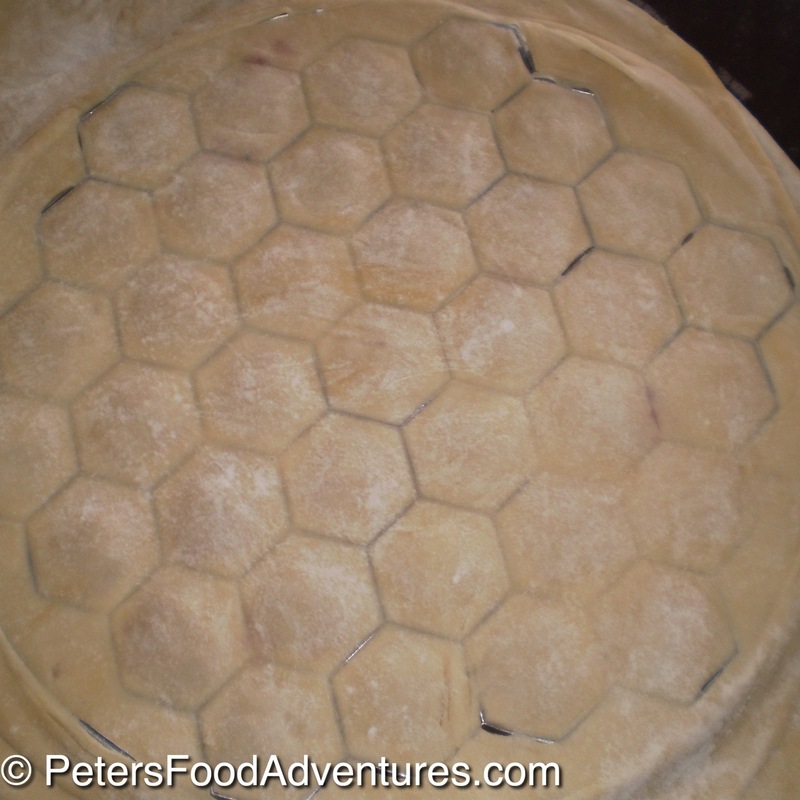 This recipe shows you how to make Pelmeni using a Mold (Пельмени) called a Pelmenitsa. Pelmeni is my all time favorite food. Ever. That’s a big statement, but nothing evokes the comfort food feeling better than Pelmeni for me. Anglo cultures have their typical meat, potato and vegetable meals, Italians have their pasta meals, but this I suppose is the Russian version of a pasta comfort meal. As long as I can remember, making pelmeni was something we did as a family. We had no aluminum pelmeni mold, it was all done by hand. Mum would roll out the pasta in long strips, and use an empty soup can or upside down glass to cut the round circles. The kids would all grab a fork of meat and make pelmeni. Check out my traditional way of making homemade Pelmeni. We also made Vareniki (Perogies) and Manti the same way. Being the youngest, I often got excused from making them, as I would make them lopsided, ugly, or have the meat sticking out, and it would become unstuck in the cooking process making it messy for mum. In my defence, my older siblings did a better job than me. Mum had large aluminium baking trays that we would fill up with pelmeni, and they would go into the freezer. Once frozen solid, she’d put them into Ziploc bags for a quick meal that could feed the family at a moments notice. Making Pelmeni using a Mold (Pelmenitsa) ensures the Pelmeni are all even and uniform in size. There are many variations of pelmeni meat flavours. The most common are the Siberian style with ground beef and onion, others add chicken or pork. For the classic meat mixture, simply remove the cabbage, sesame, chili and garlic chives. This recipe really is an Asian version of a Russian classic. A similar meal is Vareniki, which is moon shaped pasta, filled with tvorog (farmer’s cheese) or potato and cheese, sauerkraut, and even fruit. There are many variations of Vareniki, or Perogies which are like Raviolis. If you want to make colorful Pelmeni, heck out this cool Red Beet Pasta Dough recipe from the Belgian Foodie. You could use the red beet pasta dough and apply them to making colorful pelmeni. This Pelmeni recipe is one that my wife makes, with a bit of a Chinese twist. Russian borders China, and flavours can cross-pollinate. The Napa cabbage adds texture and juiciness and the sesame oil adds some flavour and depth, ensuring the meat mixture isn’t tough and dry. These flavors aren’t traditional Russian Pelmeni flavors. Turkey is a lean and healthy meat, probably a good idea based on the amount of sour cream I will eat with this meal. So now you know how to make Siberian Ravioli Pelmeni using a Mold (Пельмени). The kids love eating pelmeni is with Heinz ketchup and soy sauce. So good. I recommend trying them both ways and seeing what you like best. Bon Appetit! Приятного аппетита! Place the flour on a countertop in a mound and create a well in the centre. Crack the eggs and add half of the salty water and mix using your hands, until the dough is moist and shaggy. Dust your work area with flour to prevent sticking to surface. Continue to add the water in small amounts while kneading, until the dough forms a sticky ball. Mix and knead the dough for a few minutes until it is quite tight. Turn a bowl over the dough upside down (like a lid) and let the dough rest for 15 minutes. Knead the dough again quickly, now it's ready to use. Always keep the dough under the upside down bowl to prevent it from drying out. In a bowl, using your hands, mix the ground turkey, onion peppers, sesame oil, Napa cabbage, garlic chives and salt and pepper until thoroughly combined. 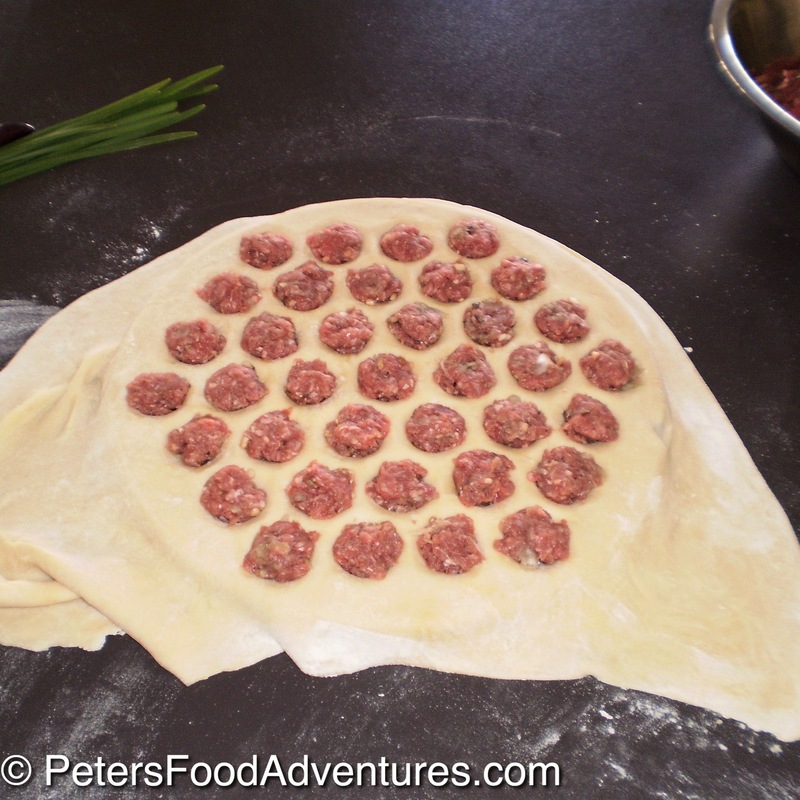 Cut off a piece of dough, and roll out with a rolling, into a size bigger than the round pelmeni mould. The thickness of the dough should be approx 2mm thick. Keep the remaining dough under the upside down bowl. Drape the dough over the lightly floured mould. 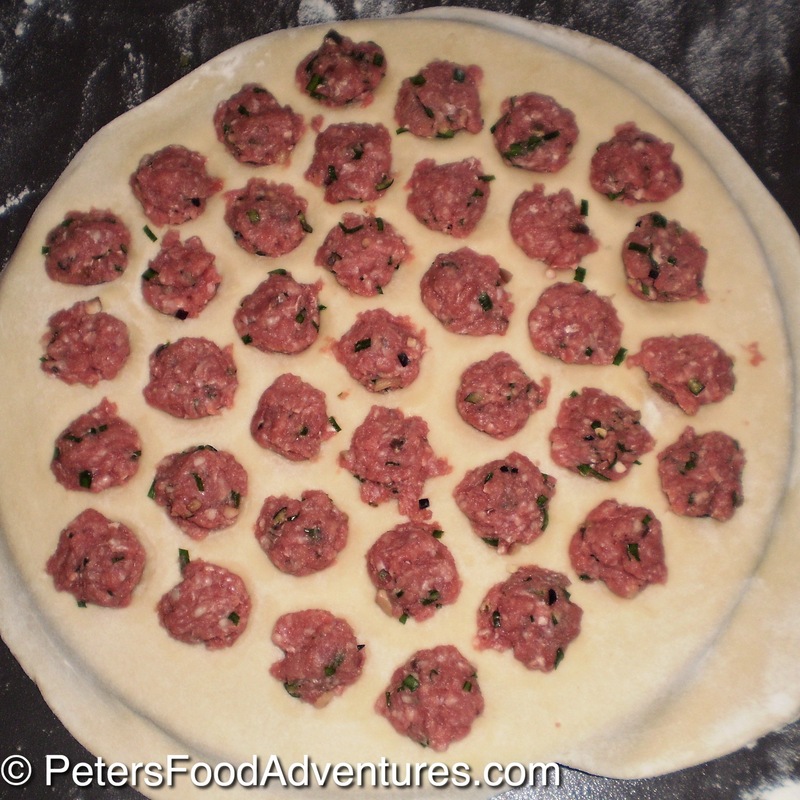 Use your hands to make small meat balls and fill each hole with the meat mixture. Take care not to be messy with your meat mixture, and keep the meat in the designated hole. Otherwise the dough layer will not bind together, and come unstuck in the cooking process. 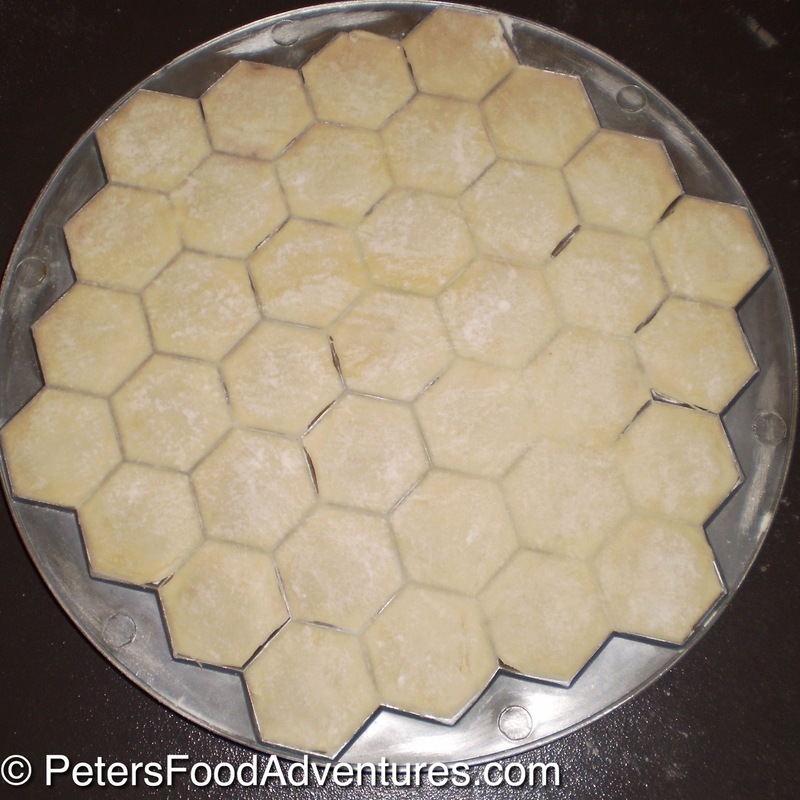 Make another round piece of dough and cover the mixture in the mould. Lightly flour the top of the rolled dough, and use a heavy rolling-pin to roll the pelmeni until they bind together and each piece is separate. Flip the mould over and shake to get the individual pelmeni out of the mould. Repeat until the dough and meat mixture are all used up. I have a theory that every food culture on earth has some form of dumpling. Those sound delicious, and what an interesting cutting tool!